Adobe Illustrator has a formidable new opponent – meet Affinity Designer by Serif! Serif specializes in creating software as an alternative to high end design programs. If you’re hesitant to pay a fortune for design software, whether you’re a professional, a student or simply trying vector illustration for the first time, Affinity Designer could be a great option for you. The majority of the work I do is using Adobe Illustrator. It’s an amazing program and in my years of using it I haven’t found a vector tool that can rival it. So when a program claims to be “the fastest, smoothest, most precise vector graphic design software available,” it’s intriguing to say the least. That’s a tall claim, so what are some of the fantastic features of this new software and how does it compare to Illustrator? Aside from all the standard tools and features offered by other vector software, here are a few extras that are the icing on the Affinity cake. Affinity Designer is touted as an incredibly fast program, no matter the size of your illustration. It pans and zooms at 60fps! And speaking of zoom, one of the problems of Illustrator that I found is that the zoom is really limited. So I’m looking forward to trying out the 1,000,000% Zoom of Affinity. I have a sticky note that says “Don’t Forget to Save” next to my shut down button. I can remove it because I know that AutoSave on Affinity will have my back. You can go back over 8000 steps. I’m not saying you’ll make that many mistakes, but if you do you have the ability to go back. One of my concerns about switching to new vector software was compatibility with all my previous Illustrator files. Affinity Designer provides seamless transition between Illustrator and other design programs. It lets you import whole files or just elements from Illustrator or Photoshop. 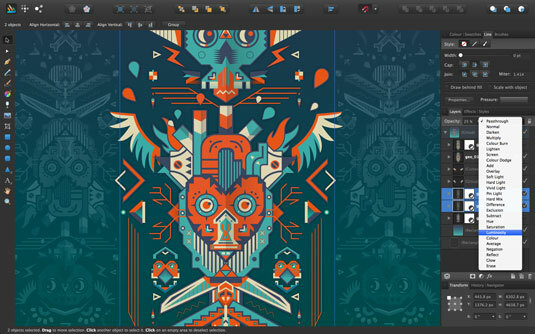 • Affinity Designer supports custom toolbars, multiple screens, and custom panel layouts. And has great usability with trackpads, magic mice, keys, tablets, rights-clicks and mousewheels. • Share straight to email, social media and iCloud. • Supports multiple document types, from tiny designs to giant billboards to UI designs. These are just a few of the numerous features available from this new software. Affinity Designer has no subscription charges and is designed for designers of every level. You buy it exclusively from the Mac App Store and get free updates as they come in. As a lifetime PC user it makes me consider getting a Mac to try Affinity for myself.